There's just no substitute for a good sharp knife. Whether you are field dressing, skinning, and butchering game or just performing cutting tasks around the home or jobsite, a sharp blade will make your job much easier and much more enjoyable. There is a definite satisfaction to the feeling of a finely honed blade gliding effortlessly through whatever it is that needs cutting. I'll probably offend some folks, but you couldn't give me a serrated blade. If I want to hack and tear, I'll use an axe or a saw. If I need to cut something, I want a razor-sharp edge - something that can only be achieved with a traditional non-serrated blade and proper sharpening. Call me old school. Call me elitist. Yup. Most knives are only moderately sharp out of the box, and they quickly loose their factory edge after a couple uses. With the intense price competition that manufacturers face, they simply can't afford to put the necessary time and work into finely honing their blades to create a long-lasting, razor edge. If you look at most new factory-produced blades, you will see that the edge is covered with thousands of very fine parallel scratches running perpendicular to the edge. These scratches are the result of the high-speed sharpening tools used in the factory. They essentially create a micro-serrated edge that feels sharp at first, but that quickly dulls as the tiny "teeth" are deformed through use. 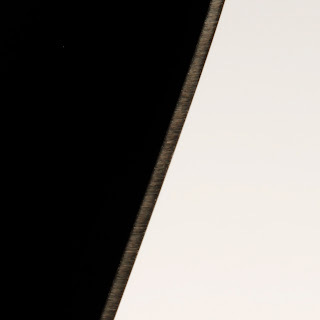 Here is a closeup photo of the factory edge on a brand-new SOG blade. You can clearly see the rough grinding marks. In contrast, here is the edge on the Buck 119 that I hand hone in the following video. 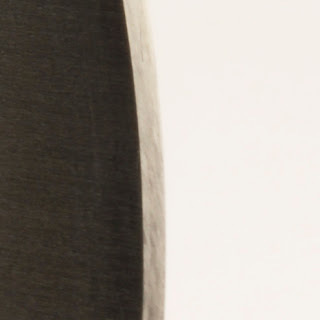 Notice that it is much smoother and that I've decreased the sharpening angle to give a sharper, more durable edge. The good news is that with a little effort and the right tool, you can easily put a long lasting, shaving-sharp edge on your blades. 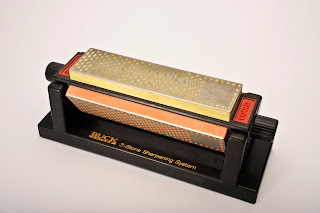 Here is a review of the sharpening system that I currently use. I've used lots of different systems over the years and this is the best I've found so far. I've tried less expensive, similar-looking products in the past. The reason they are cheaper is because they use inferior sharpening surfaces that just don't do the job. Don't waste your money on one. At the time this was written, none of the big three outfitters (Bass Pro, Cabelas, or Gander Mountain) carry this sharpener, but it is available at a good price through Amazon. To be honest, I have no idea what angle I use. I just do it by feel. I wouldn't get to hung up on the exact angle, the key is just to keep it as consistent as possible between strokes. I tend to use a little shallower angle for filleting knives and small pocket knives where I'm going for maximum sharpness and a little steeper angle for heavy hunting knives that are going to be used to hack through bone. The good news is that if you don't like the angle you've ground, just go back to the coarse grit and change it. The only way I can see you damaging a knife is by putting too fine an edge on it and then using it for some heavy-duty cutting job - you could possibly chip the edge. One other thought. If you haven't used a sharpening stone "freehand" before, start on a knife that doesn't have a lot of monetary or sentimental value in case you put a couple extra scratches on the blade.